Featuring one of the best shopping and entertainment hubs in Singapore, District 9 includes Orchard Road, River Valley and Cairnhill. It is part of Singapore’s central business district (CBD) and has become a must-visit spot for Singapore tourists. All of this makes it an attractive region for those looking to invest in property in the area and make District 9 their home. A huge tourist attraction and world-renowned as the most popular shopping enclave on the island, Orchard Road underwent a $40 million revamp in 2009. The name originates from the orchards and plantations that existed in the area up until the 20th century. Floods occurred way back in the 1900s but were addressed by a deepening and widening of Stamford Canal. During the 1970s, it was the golden age for the vicinity of Orchard Road with the construction of pioneering landmarks such as Plaza Singapura, C.K. Tangs and Mandarin Hotel. In 1974, Orchard Road became a lively one-way street beginning at the junction of Orange Grove Road and Tanglin Road and ending at the junction of Prinsep Street and Bras Basah Road. An extensive underground infrastructure incorporating underground pedestrian walkways between malls underneath the streets connects with other streets in the district, making it safe and comfortable for residents to move around between retail destinations. Spanning almost 2.2km, Orchard Road represents one of Singapore’s best retail, dining and entertainment boulevards, catering to any taste or budget and ranging from luxury brands to high street fashion. District 9 has a huge selection of exclusive cosmopolitan bistros and on the other end of the scale, a number of popular international fast food restaurants. Fronting Orchard Road, ION Orchard Mall is home to designer brands and the largest Prada flagship store in the Asia Pacific region, as well as Sephora’s largest store in the area. Other contemporary iconic shopping destinations include Knightsbridge, H&M Orchard Road, 313 @ Somerset and Orchard Central. 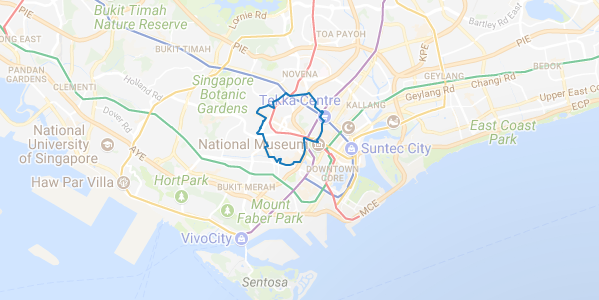 Public transportation is very convenient around Orchard Road with plenty of buses and taxis plying the route including three major MRT stations – Orchard, Somerset and Dhoby Ghaut. These stations are vital commuting hubs for locals, students and tourists that converge to Orchard Road for their daily activities - and perfect for local residents that want to stay well-connected to wider Singapore. River Valley flanks Orchard Road, and is located south of Orchard Boulevard, Devonshire Road, Eber Road and north of Ganges Ave Road and bordered by Nathan Road, Cable Road, Jervois Road and part of Crescent Road on the west side. River Valley acquired its name from its location on Singapore River’s northern bank, and because it is flanked by small valleys. Singapore’s first Prime Minister, Lee Kuan Yew, lived in the Oxley vicinity and since then, Oxley Road is famous for its residential properties with tight security. In the River Valley region you’ll find exclusive upmarket properties for Singapore’s high income and foreign clientele population, and it’s also a hot dining spot for locals hunting for Hainanese chicken rice and Nasi Padang, which can be found in pre-war shop houses along River Valley Road. One notable piece of prime real estate currently under construction would be Gramercy Park, that comes complete with condominium facilities, private lift and concierge service; a freehold project is due to be ready in 2017. All 174 apartment units will be fully fitted with top quality finishings, wardrobes, sanitary fixtures and electronic appliances. The project also boasts 248 car park lots and a spacious layout. Another luxury development, UP @ Robertson Quay features 70 units within 2 blocks of 4-storey residences that come with attics and basement carparks. Completion is due in 2019 and these sumptuous accommodations will boast of 7.2m floor-to-floor ceiling height, private timber pool decks and dual purpose furniture choices. A huge shopping mall by the Singapore River, Great World City caters to locals, with a Cold Storage supermarket, Best Denki electrical store, ZARA and Golden Village Cinema. Valley Point is a small shopping mall nestled among River Valley’s residential areas, providing the necessities, while many scattered clubs and pubs in the area provide nightly entertainments. Most of the area’s nightspots can be found along Mohammed Sultan Road and internationally-renowned Zouk nightclub can be found on Jiak Kim Street. The Ministry of Manpower building is also located in River Valley where working foreigners can obtain or renew their work permits. Getting around River Valley by public transportation is convenient, with buses and taxis and the Great World MRT station currently under construction to better serve the neighbourhood. The Cairnhill area is located north of Orchard Road, bordered by Scotts Road, Bukit Timah Road and Cavenagh Road. A sub-zone of Singapore’s central region, the Cairnhill estate was named Carnie’s Hill when Charles Carnie who owned a nutmeg plantation, built his residence on the hill in 1840. At the turn of the 20th century, Cairnhill evolved into an ideal residential estate for Singapore’s wealthy and expatriates where Cairnhill Plaza built in 1976 started the trend of posh, exclusive and luxurious high-rise living. Many international schools are located within the vicinity, including the Overseas Family School, ISS International School and Chatsworth International School. Other reputable local schools nearby include the Singapore Chinese Girls School, Anglo-Chinese Primary School and high schools such as the Anglo-Chinese Junior College. At Cairnhill, you’ll find the first freehold Ritz-Carlton property in Asia - the Ritz-Carlton Residence built on elevated prime land just a stone’s throw away from Orchard Road. This property sets a new standard of luxury living in Singapore as these homes feature magnificent finishings, excellent facilities and exemplary services from the legendary The Ritz-Carlton. A new household condominium, The Peak @ Cairnhill, will be completed this year, featuring single units and penthouses. As it is a freehold project, this property will capture many buyers aiming for financial investment, as it has a great leasing yield opportunity being near to the Central Business District (CBD) location. Some of the other most desired residential properties in Cairnhill are Cairnhill Crest, The Light @ Cairnhill, Cairnhill Residences, Cairnhill Rise, The Edge @ Cairnhill and The Vermont. Shopping is so convenient with Orchard Road nearby and besides the usual bus and taxi services you can get around Singapore using the Newton, Orchard and Somerset MRT stations adjacent to the neighbourhood.